Sphero (creator of the BB8 Star Wars bot and the Bolt educational toy) has taken an artistic turn with a new wearable for kids. 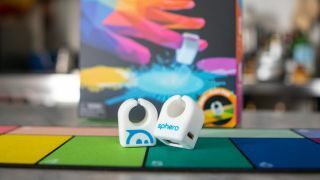 Launched at CES 2019 in Las Vegas, Specdrums are a pair of app-enabled rings that let kids create music by tapping their fingertips on different colored surfaces. Sphero recently announced that it was moving away from licensed toys to focus on its own educational bots, which support kids' learning in STEAM fields – meaning science, technology, engineering, art and maths. While the Sphero Bolt range teach essential programming skills, Specdrums are the company's first foray into the arts. Sounds are customizable, allowing youngsters to explore drum beats, piano notes and over 100 other instruments. Tapping on different colors produces different sounds, and although the rings come with a multi-colored playmat for experimenting, the rings will also work with everyday objects in different colors. Specdrums were initially made with the classroom in mind, but are affordable enough for home music-making too. A single ring costs $64.99/£64.99/AU$109.99.